Online co-op campaign -- do the entire campaign online and with your friends! Unique Physics-Based Abilities and Weapons -- shred the hordes of oncoming aliens! Innovative Swarm Gameplay -- shape and manipulate the oncoming enemy formations to maximize destruction! 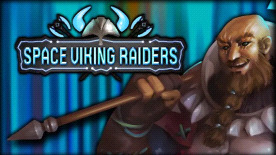 Deep Tactical Gameplay -- only the best vikings can master the hardest difficulties and achieve the high-scores. It takes a high degree of cooperation and individual skill to defeat the hardest difficulty. A warning to the weak! Blast through throngs of enemies from 3 dimensions! Battle the fleets of the Federites, face the gory horror of the Sluglings, and feel the wrath of the Sugarfiends. Assault them on their homeworlds, destroy their buildings, raid their lands, and take the elementium that you came for! 10 Missions, with fully voice acted dialogue! Roughly 5 hours to complete the campaign for the first time. Singleplayer, and 2-4 player co-op campaign supported. 3 different difficulty settings for a more chill experience or legendary mode for the try-hards. A large selection of epic music to splatter your foes to. 4 Playable characters, each with many unique abilities. Endless mode, survive as long as you can with limited health and energy against the endless horde. Got ideas? Join the Discord!